Lately, Miss Muffet has taken a real liking to nonfiction, so I've been reading factual books aloud to her at lunch time, or after lunch when her sister is asleep. 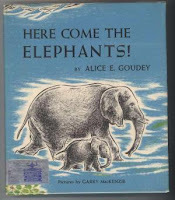 Recently, we started working our way through a stack of books from Alice E. Goudey's vintage Here Come the Animals series. Published in 1955, Here Come the Elephants is one of the first books of the series. The text of Here Come the Elephants! is divided into two parts. The first focuses on African Elephants in Tanganyika (now Tanzania) and the second on Asian Elephants in Burma. In both sections, the reader follows the life story of a baby elephant from his birth through his adulthood, witnessing through his eyes the behavior of elephants in the wild and their interactions with man. Though this book presents factual information, its narrative reads like fiction. Instead of simply listing facts about elephants in a professorial third person voice, the text allows kids to experience life in the wild alongside the baby elephants. The baby elephants are called Little Elephant, and their mothers Mother Elephant, which helps young readers sympathize with them. I like that the animals are given descriptive names rather than cutesy ones, and that they become characters without having to take on any human traits. I think this is what has drawn Miss Muffet to this series; everything is described realistically, and in the context of the animal's natural habitat. There is also no sugar-coating of the facts. For example, in the section about African elephants, a male elephant called The Wicked One attacks Old Grandfather Elephant, sending him away from the herd. Later, after fighting Father Elephant and becoming leader of the herd, The Wicked One recklessly gets himself killed when he raids the natives' crops. This information is delivered matter-of-factly, without assigning any emotions to the situation. As we are very frank with Miss Muffet about subjects like death, I was glad to see this book simply presenting what happens in nature without commenting on how sad or scary it might seem. I can't stand it when authors (or anyone, really) ascribes human intelligence and emotion to animals, and I was thrilled not to have to contend with that in this book. Despite its age, this book is the best nonfiction title for kids that I have read in a long time. Some information about hunting elephants for ivory and training elephants to do tricks may be outdated, and there are similar minor outdated details in the other books we have read from the series as well, but it's easy to point those out and look up the updated information. On the whole, this book is well-written, utterly engrossing for a preschooler, and unsentimental in its portrayal of nature. For me, that makes it a five-star read.